The affordable Roland HP702 brings style and premium piano performance into your home. Practice at midnight, immersed in sound from the Headphones 3D Ambience feature. 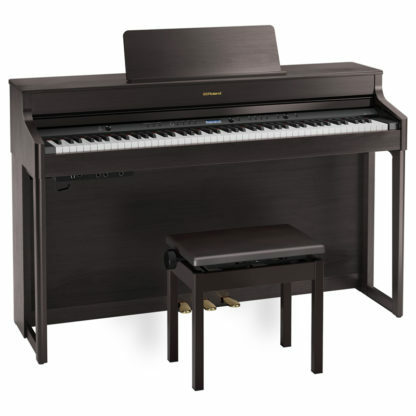 The affordable Roland HP702DR brings style and premium piano performance into your home. Practice at midnight, immersed in sound from the Headphones 3D Ambience feature. Wirelessly stream songs and app audio via Bluetooth or try the onboard tutorials and improve your playing skills. Whatever the musical scenario, the HP702 delivers a superior piano experience—for far less than you think. Stylish cabinet design with a compact footprint With the Roland HP702DR. The compact Roland HP702DR fits in any living room or apartment, complementing your décor with its clean lines, natural finish, and sleek curves. Traditional and timeless with a contemporary twist, the versatile HP702 makes a stylish statement without shouting. Available in charcoal, dark rosewood, light oak, and white finishes. 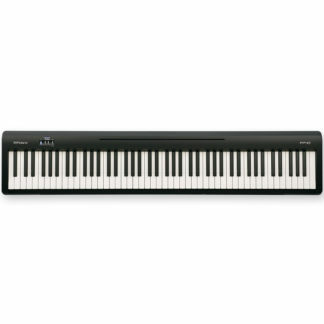 Expressive performance with the PHA-4 Standard keyboard. From beginners to seasoned performers, the HP702’s PHA-4 Standard keyboard brings out the best of your playing. 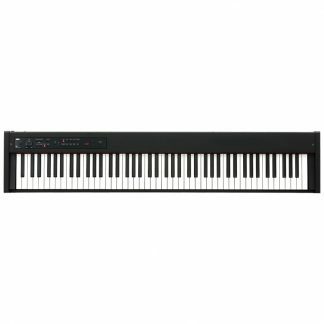 And with fast-key repetition and high-resolution sensing, this responsive keyboard was designed to satisfy the most demanding pianists—so you won’t need to upgrade as your technique improves. The keys even replicate the look and feel of real ebony and ivory, and their textured, moisture-absorbing properties mean your fingers won’t slide off. Playing the piano is one of life’s most rewarding experiences, whether teaching yourself or watching your family discover a passion for music. Roland’s HP700 series supports your ambitions with gorgeous piano sound, sophisticated styling, and helpful features that’ll keep you coming back for more. And with the flexibility and expression to suit any genre or playing standard, you’ll have an instrument that grows with you. Whatever your reasons for owning a piano, the HP700 series can help fulfill them—bringing style, culture, and music into the heart of your home. An HP700 piano can be the centerpiece of a room—or so discreet you hardly know it’s there. For silent practice day or night, connect headphones and enjoy immersive sound that won’t disturb your family or neighbors. For interactive study, wirelessly connect the piano with your smartphone via Bluetooth® and play along with your favorite tunes or sharpen your skills with online tutorials. For performance, adjust the volume-controllable internal speakers to fill the room with music. And when you’re not playing, you can use the Roland HP702DR or HP704 pianos as your home entertainment system, streaming music with clear, detailed highs and rich, powerful lows. Roland HP,GP and LX series digital pianos are covered by a 10 year manufacturer warranty. Roland products ship via courier from either our Melbourne store or Roland’s warehouse in Sydney; fully insured for your piece of mind. Orders require a signature on delivery and we suggest using an address where someone will be present the for the speediest delivery time. For delivery attempts with no one present to sign, your order will be taken to the courier depot and a card will be left for you to organise redelivery.